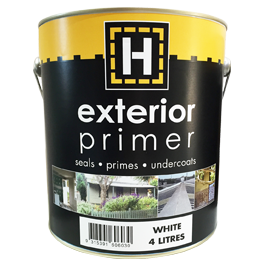 H-brand exterior primer is an ultra premium quality, quick drying 100% Acrylic Sealer, Primer, Undercoat for use on exterior surfaces. It provides excellent adhesion for subsequent coats, whether enamel or water based imparting extended durability to top coats, including "No Primer Required" types and because of its excellent durability can be left some weeks before overcoating. Timber, Building Boards (including M.D.F. Particleboard and similar), Masonry, Galvanised Iron and rust resisting metals. Available in White only which is compatible with all major tinting systems. Tinter, if added, should be shaken and stirred in thoroughly immediately after addition.